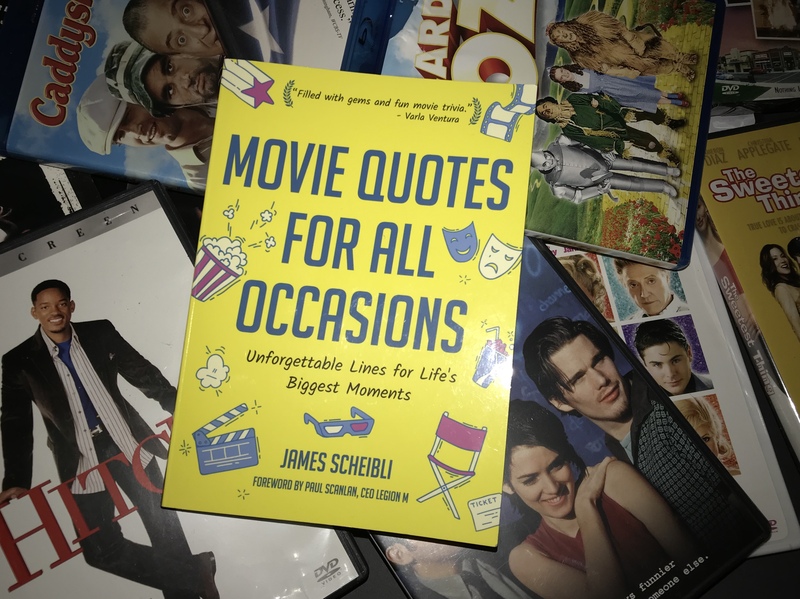 In “MOVIE QUOTES FOR ALL OCCASIONS: UNFORGETTABLE LINES FOR LIFE’S BIGGEST MOMENTS”, author James Scheibli, a social media manager and freelance writer based in the Bay Area, has put his pop culture expertise and movie-loving upbringing to good use in this book of memorable (and some not-so-memorable) lines from movies that span every genre. He was inspired to compile these quotes when he himself was at a loss for words trying to write a speech for his sister’s wedding. When inspiration hit in the form of a quote from the sci-fi movie “Serenity”, he realized other people who are grasping in the dark for a little spark to ignite their creative juices might benefit from a line or two from movies they may never have seen or never thought of as a feasible font of wisdom. Reading quotes from many movies I have seen resonated with me in different ways. Not only do I appreciate the words themselves, but I also was able to relive how I felt when I watched the scenes in which these quotes were originally spoken unfold on screen. His selections for the different scenarios one might find oneself in are eclectic and comprehensive in scope and emotion. He goes deep into popular movies as well as those on the fringe to get just the right words that might ring true to someone in a certain situation. He hit the nail on the head A LOT. Yoda’s “Do or do not. There is no try.” I mean… it doesn’t get any more popular or fundamentally basic than that. “I have loved her, even when I hated her… only married couples will understand that one.” from “Crazy, Stupid, Love.” is just a truth bomb in and of itself. The last quote of the book, in the Activism and Social Change section, is by far the longest at two full pages and still socially relevant today. It is from the 1940 Charlie Chaplin movie “The Great Dictator.” This speech apparently takes place during the movie’s climax and it packs quite the punch. I’ve never seen it, but I might just look it up. There are also additional tidbits in the book that a movie-trivia buff will find interesting. The Fun Facts he’s added throughout regarding the movies are interesting and insightful. Also, film recommendations for each section are a nice bonus. Sure, you can find a random quote that speaks to you, but seeing where it came from and what it meant to the people hearing it in the confines of its movie, brings a whole other level of gravitas to what spoke to you to begin with. While he is spot on for most of the book, there were a few misses in my opinion. He takes the part from President Shepherd’s climactic final speech in the “American President” and used the section where he talks about pandering to middle-aged, middle-class Americans as if Shepherd was praising this vote-getting strategy when the opposite was actually the point of the speech. He also uses “We are Groot” from “Guardians of the Galaxy” as an inspirational quote. I get that it’s usually “I am Groot” and it’s supposed to bring forth feelings of camaraderie, but I also feel like too much backstory would have to be included in any subsequent speech to find that particular quote as a feasible jumping point or conclusion. This book is available for purchase at Amazon or Barnes & Noble. Published by Mango Publishing Group.